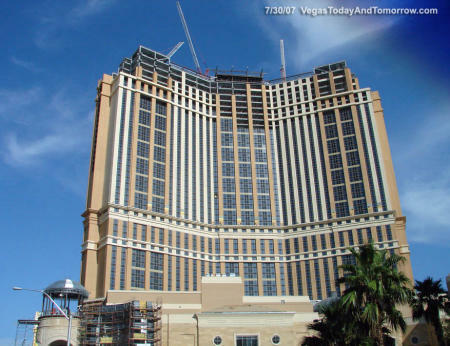 The Las Vegas Palazzo hotel is just weeks away from opening. Quite when it will open is anyone’s guess, though, as there are contradictory reports of its opening day. The Las Vegas Sands Corp, the Palazzo’s owners, are claiming that it’ll open on December 20th, but the Palazzo web site will only let you book from December 28th. Er, right. So presumably the Palazzo will be open for business fully from January 18th, but the foyer will be open on December 20th so the company can claim it met its 2007 opening deadline. Whatever, the fact that they managed to get the Palazzo open in such a short time is impressive enough, as is the building itself. There will be a grand opening celebration on the nights of January 17th and 18th 2008 as well, which should be spectacular.